Because I didn’t expect election results the way it came. 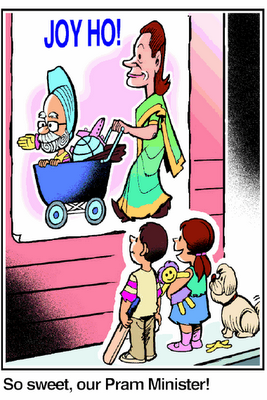 Because I will be ruled by “Puppet Singh” for the next 5 years. Because Rahul baba will become the PM whenever he DESIRES (Yeah those are the word of Janardan Dwivedi – who is the chairman of media cell for congress). After all, India is Rahul baba’s property. He can come and rule us whenever he desires. Because its a shame that national election is not fought on national issues like terrorism, economy, vision for development, national integrity, controlling population, increasing resources. Because national election is fought based on caste, region, mind boggling and unrealistic freebies, cheap promises, money and muscle power. Because one bottle of alcohol, 500 rupee note and a plate of biryani decides who will rule us. Because 150 members out of 544 are tainted having criminal background. When I think - where this nation is heading for? What will be the state of this nation after 10, 20 or 40 years? When I think – What is the difference between monarchy and democracy where one family rules one billion people for four generations? When I think – If Indians will ever look beyond their family, home and caste and think about the nation? That Mulayam and Amar singh are brought down to earth. That democracy gives you a chance after every 5 years to bring a change. So hope by next election...mmmm..yeah, hope! And above all, Left front is cut to the size! I am sure now they have more leaders then number of seats in parliament :-). I will pray for the day when country is sanitized from the leftover communist. Hope and faith in God – these are the two essential necessities to survive in India. A picture is worth a million words... It says ALL!